I'm having so much fun with the deer die cut from the Santa's Sleigh bundle. The little deer looks good in just about any color and on just about any background. 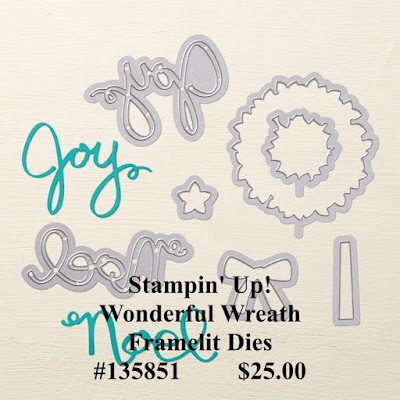 All products Stampin' Up! I thought the piece of old book page and the little bit of Real Red for the deer's nose really made this card interesting. Want to earn a free gift during the month of September? Simply place an online order between $50 & $149.99 (not including tax & shipping) and use the hostess code shown in the top of the right hand column of this page. Your gift will be mailed around the second week of October. If your order is over $150, don't use the hostess code...you get all of the hostess benefits at that point! If you will be using the hostess code, see below for instructions on how to do so. Coco always had it right. Take a simple design and glam it up a bit and you have something that people will talk about. I think this card below fits the bill. All products Stampin' Up! 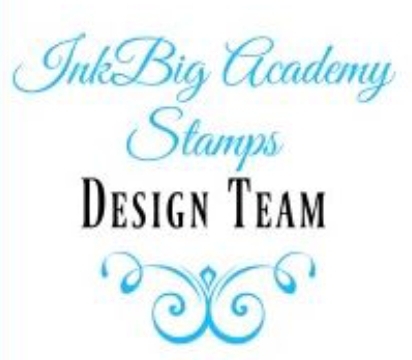 This is another design team sample for Ink Big Academy Stamps. 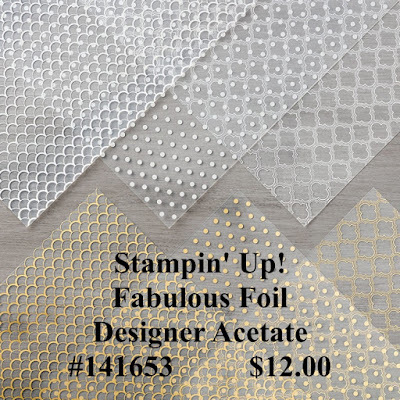 When I first laid eyes on the Fabulous Foil Designer Acetate, my jaw dropped. Not only is the gold side beautiful, but it is reversible to a silver side, meaning something for everyone! These are 12" x 12" sheets, 2 each of 3 single sided designs. It makes a great layer on almost any project. The other parts of this card that I think are simple, yet stunning are the curved layers in the Whisper White top layer of the card and the graduated color of the bottom layer under the Foil Acetate. I sponged the bottom layer of Whisper White cardstock with Emerald Envy ink until I had the almost ombre look I wanted. The curved layers were cut using the long die cut from the Swirly Scribbles Thinlits. I think it's great when you can use a die in a different way than you first imagine it being used. I finished this card off with the word "Joy" from the Wonderful Wreath Framelit Dies. 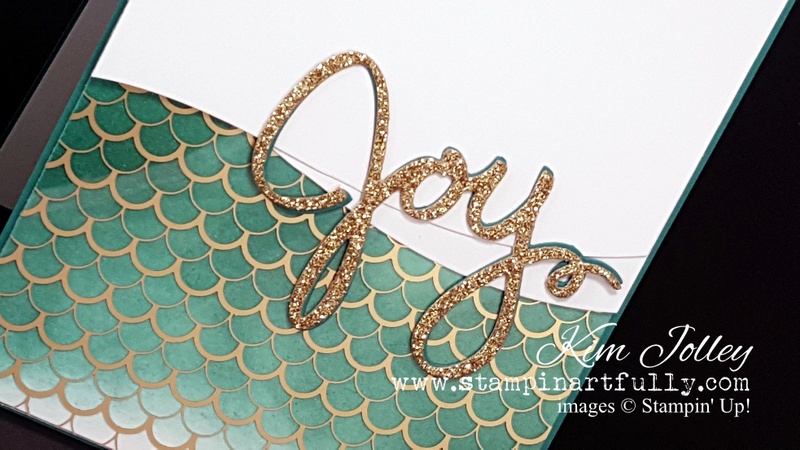 I cut the top layer from Gold Glimmer paper and layered it up on another one cut from Emerald Envy cardstock. Don't forget to check out the current special offers. This promotion ends today...get the deals while they last! Don't miss out on clearance rack items that are up to 60% off while supplies last. Click here to see all of the items available. 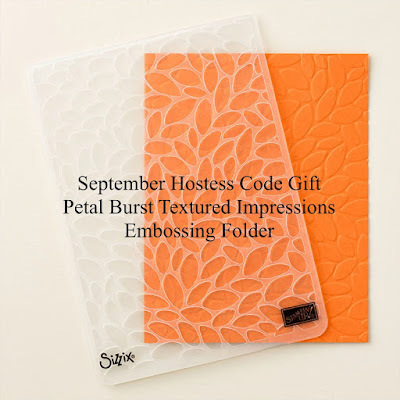 I just love some of the new stamp/die bundles in the Stampin' Up! Holiday catalog. Two of my favorites are the Christmas Pines/Pretty Pines bundle and the Santa's Sleigh bundle. A few days ago, I spotted a gorgeous card on Pinterest by an amazing stamp artist named Deepti Malik. I just knew I had to CASE it! 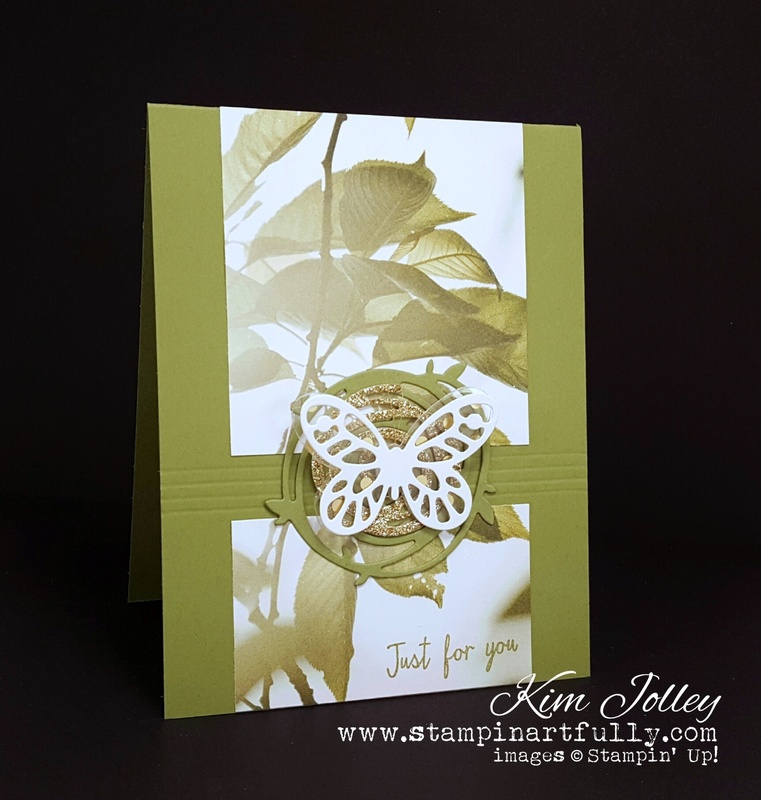 Below is my version of her beautiful card using Stampin' Up! products. A little tip: I realized I was out of Gold Glimmer Paper and really wanted the deer to be glittery. I simply took a piece of cardstock and tapped Versamark all over it. Then I embossed that piece of card stock with Heat & Stick Powder and applied Gold Stampin' Glitter to the sticky surface. When I do this to make my own Glimmer Paper, I take an ordinary piece of scrap typing paper and fold it in half, put the glittered piece of paper inside the folded piece and I run my bone folder all over it to make sure all the glitter is stuck as well as it can be, then I shake off the excess glitter. Voila! My own Glimmer Paper. At that point, I used the deer die to cut out the shape. For this card, I also applied Heat & Stick Powder to stamped splatters (using a stamp from Gorgeous Grunge) and applied Gold Stampin' Glitter to the splatters. Somehow during the "glittering", I have ended up with it on my face and clothes. Funny, it doesn't seem to need the Heat & Stick Powder for that. Ha! Click here to see everything the Holiday Catalog has to offer. Don't forget to check out the current special offers. This promotion ends tomorrow...get the deals while they last! I had been playing with the new stamp set called Christmas Pines, when I had the idea to mix it with a little watercolor and the tree die from Santa's Sleigh dies. I watercolored a panel, then die cut the tree out. I stamped & embossed the pine image on the tree only, then stamped & embossed the scattered looking snow/star image on the back ground. 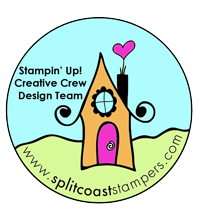 All products Stampin' Up! I think this made an elegant looking card that actually took very little time to create. It almost has a dreamy quality about it. The gold metallic thread and sequins complete the look. Supply list below. 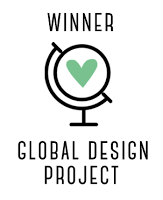 I'm playing along with the Global Design Project challenge this week, which is "CASE the Designer". When you CASE the Designer, you might be inspired by the colors, the pattern, or even the theme. It is really up to you what you would like to be inspired by. I chose to use the layout of her lovely card. 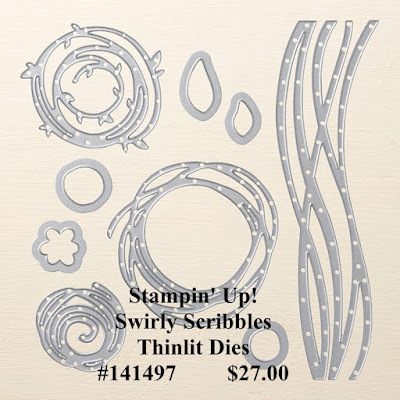 All products Stampin' Up! 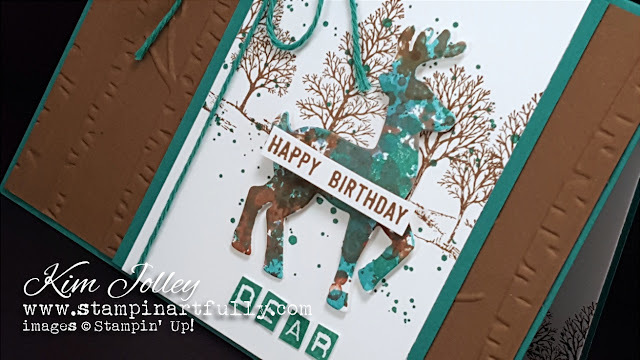 I knew when I purchased the Santa's Sleigh bundle from the new holiday catalog, I just had to find other ways to use the deer image and/or the die cut. 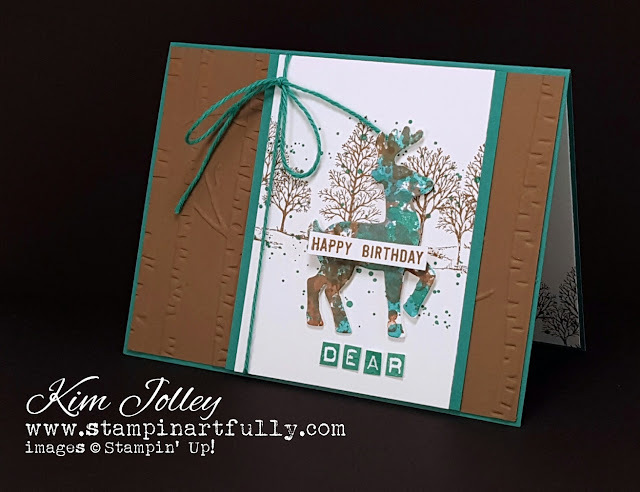 For this card, I used the large splatter stamp from the "must have" Gorgeous Grunge set to create a colorful background to die cut the deer image from. I used Bermuda Bay, Emerald Envy & Soft Suede to create the colorful piece. It almost made me think of camouflage, even though that wasn't my intention at the beginning. Wouldn't this make a great guy card? Click here to see everything the new catalog has to offer. Stampin' Up! has also came out with a brand new crop of special offers today. Don't delay if you see something you want. 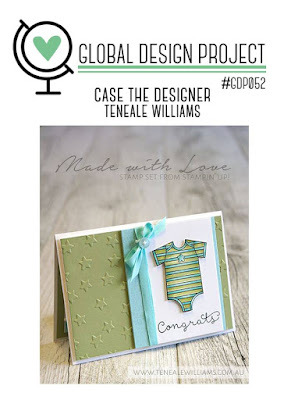 Want to get more done in less time and create beautiful cards at the same time? 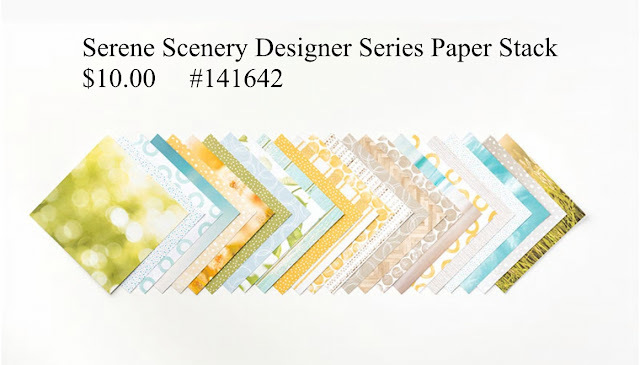 If so, the Serene Scenery Designer Series Paper Pack is just what you need! The following cards were actually made for my gig as a design team member over on Inkbig Academy Stamps. 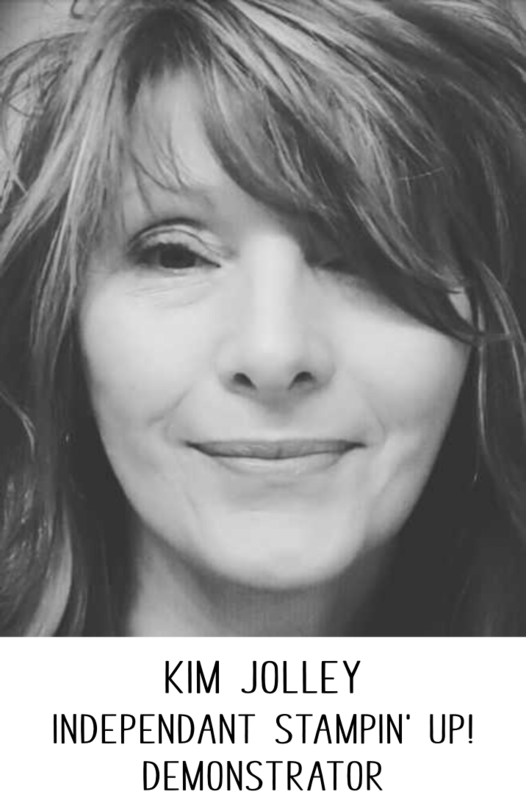 Lisa Pretto was kind enough to ask me to be on her team and I'm so excited! All products Stampin' Up! 25% off and the new Holiday Catalog is LIVE! 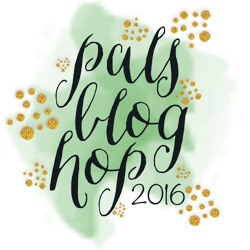 I apologize for this blog update being a day late due to an end of summer cold that has me down a bit. However, I wanted to let you know that you can save 25% on select Stampin' Up! items until September 21. Click here to see the first week of discounted items. Stampin' Up! will change the discounted items weekly. It's here, it's here! Click here to order from the new holiday catalog. There are so many wonderful samples, new stamp set, dies, punches, etc...it is a real drool fest!